If you go to Amazon, select books, and type in Steampunk, you will get a supposed 100 pages of 16 entries each. No, I didn’t tap through all of them. In the novel I am presently working on, I had cause to quote Samuel Johnson’s A man who is tired of London, is tired of life. I think I could paraphrase that as a man who is tired of steampunk is tired of reading. Steampunk seems to encompass everything, which makes it a little hard to throw a rope around. I have been reading proto-steampunk all my life, but the genre (if it is a genre) has only been identified as such since about 1980. What is it, other than everything? I feel a little like a wild kid in a permissive household; how can I be a rebel if I can’t find any boundaries? 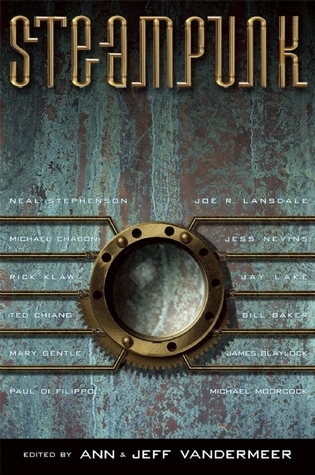 The anthology Steampunk consist of thirteen excerpts and short stories, and three essays tackling history and definition of steampunk. I read only bits and pieces of the thirteen, and that needs explaining. I generally don’t like short fiction. I read tons of it when I was growing up and some of it was superb, but generally it is long on the clever and short on humanity. Perhaps if someone had held my feet to the fire and required that I finish them, I would have found more to like in these short stories. Probably not. I skipped Moorcock because I had read the novel from which the excerpt was taken. I skipped Blaylock because I am reading one of his novels now. Both authors are excellent. Many of the other stories left me cold. They were strings of events happening to people I could not care about. Also, the stories seemed universally dark. That is a valid anthologist’s choice, but I don’t care for horror and I outgrew dystopias thirty years ago. Life is a mixture of light and dark, and literature has to mirror that if it is going to hold my attention. Mind you, most of what I sampled was reasonably well written. It didn’t fail for lack of skill, but there did seem to be a lot of throwing ideas around without linking them together. Short stories can sometimes get away with that. The steampunk novels I am presently reading all seem far better structured. However, there was one shining light. Jess Nevins’ introduction: The 19th-Century Roots of Steampunk was a superb explanation of steampunk’s precursors. I learned a lot from Nevins. This entry was posted in A Writing Life and tagged fantasy fiction, literature, science fiction, steampunk, writing on October 4, 2017 by sydlogsdon.